I’m in the middle of re-reading The Omnivore’s Dilemma (highly, highly recommended! and that’s an affiliate link so thanks for using!) and it is spurring me to figure out if we can raise the quality of the food that we’re buying without busting our budget. (I also have gotten into lengthy “discussions” about food with two vegetarians in the last couple weeks!) Kyle and I have had many clashes over food and money spent on food in the past and right now we’re in a shaky compromise, so I guess I’m trying to stir things up again! Kyle and I eat differently, though we share some base foods that we prepare differently. Sometimes he eats the food I cook and sometimes I steal his snack food. :/ I focus on eating meat (or something else protein-heavy) and vegetables (occasionally low-sugar fruits) at every meal; I’m largely grain-free. I basically just try to eat real food. Kyle eats the standard American diet but lower on the processed food chain than he used to. We both cook or assemble our meals nearly all the time. The only food we buy that I truly consider to be high quality is what we get from our CSA ($12/week) or the farmer’s market (as needed). We get half or more of our produce from these sources in the spring and summer, but the only meat we get from there is ground pork or pork sausage. At the grocery store, we don’t make an effort to buy organic/local/grass-fed/free-range. We spent most of our food money at Costco, where we buy generally whole foods. We follow up at Kroger for smaller quantities and more-processed food. My highest priority is to improve our meat sourcing. I’m more comfortable with the split we have between some local produce and some conventional than I am with getting nearly all conventional meat. But I don’t want to shock our budget (or our shopping habits or my husband) by jumping into to buying high quality meat 100% of the time. I’d like to moreso dip our toes in. So this is the proposal: That we spend normally from our grocery budget throughout the month, and then spend whatever money we have left over on buying higher-quality meat, either right at the end of the month to freeze or by carrying the money forward to the next month to spend at the next opportunity. I sort of like this system because it might motivate us (or at least me) to be more conservative in our grocery spending throughout the month so that we can have more leftover money for quality meat. We don’t often pay attention to sales or use coupons now but with a bit of effort maybe we can save a few dollars here and there. I’ve heard that this kind of system can work well in other areas – motivating spending less in a discretionary category by allowing freer spending with the remaining money. Anyway Kyle’s not super excited about this idea – like I said the quality meat thing is my priority, not his – but he’s not opposed to it, either. We’ll see what happens the first time it comes up – not this month, most likely. Do you spend extra money on food you consider to be high quality? What is the area of your budget in which you’d most like to spend more money? Do you have any special purpose for money left at the end of the month in a budget category? 51 Responses to "Edging toward Quality Food: Proposal"
I don’t eat a lot of meat, but when I do I typically get the standard variety. I’d love to eat higher quality meat, but I think it comes down to a feedback problem. Eating higher quality meat isn’t going to automatically make me feel healthier. It’s probably a good call in the long run, but in the moment, there’s no feedback loop that makes me want to buy more high quality food. Although when it comes to the rest of my diet, I try to eat mostly plants and grains. I buy almost no processed food (when I have time). I’ve been surprised by how much better I feel by changing some aspects of my diet, so while I don’t expect it I wouldn’t be shocked if I felt better after switching to quality meat (that if we went 100%, not just occasional). But we (and you) do lots of things that don’t give us instant gratification, sometimes at great personal cost, so meat sourcing isn’t all that different. Yay Cabot. My grandparents (and mom) were part of the Cabot Farmers Coop. Can’t beat their extra sharp aged cheddar!! It is crazy how yogurt can vary and how much sugar is added. Like, there’s fake Greek yogurt on the market now – what?? I haven’t sourced yogurt from awesome cows like you did, but I have switched to buying plain, lowest-sugar-possible yogurt and can’t believe I used to eat the flavored stuff! Like you said, you can just add the flavors/foods you want yourself and it’s so much healthier! As for cooking meat, it took me a few years (and really, just getting married) to get used to it. Now it’s such an integral part of my diet that I can’t get around preparing it myself, but I try to keep it simple. I don’t normally taste dishes as I cook anyway so I guess that aspect doesn’t bother me! I agree with the desire to get off the typical meat production chain as there are a lot of not so great stuff that happens with the animals and in production. We have been scalling back on the meat and working to add more veggies/fruit. Although carbs are still a bigger part of our diet then maybe they should be. We have been trying to incorporate lower food chain items as they are more efficient and cost effective. I’m eating more vegetables and fruits than ever and I love it! There’s no room in my belly now for grains. 🙂 But we definitely need to hit up the farmer’s market more because our CSA is ending soon. The animal treatment aspect doesn’t bother me (I know, I’m a monster) as much as how the food is ultimately affected by the genetics, diet, disease, stress, etc. Mint Blog just did a post about buying meat at the grocery store vs. buying a portion of a cow directly from a farmer and stashing it in a chest freezer. In the long term, the purchased cow portion still came out ahead even with the freezer purchase. I am with you completely on the quality of meat. I buy organic meat/chicken now at Costco, but I know if I could buy it directly from a free range farmer in Pennsylvania (about 2 hours away), I’d have better meat with much better fats for me. My fiancee and I don’t have a chest freezer yet but we’re saving up and hope to start getting better quality meat soon. Also, I second the Cabot recommendation for Greek style yogurt. I get their full-fat Greek yogurt ($4.99 for a large container) and I have grown to love plain yogurt as a result. The yogurt isn’t cheap but it helps keep me full and is full of great protein and good fat. 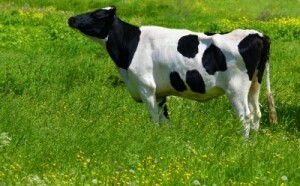 I would love to be able to buy a portion of a cow! That’s been on our radar nearly as long as we’ve had our CSA. The storage issue is why we haven’t done it. Unfortunately we rent and are moving soon so buying a chest freezer isn’t going to happen – yet. That’s awesome that you’ve already started buying organic at Costco and are working toward the next level! I’d second the opinion of tara. Instead of buying/freezing small portions of meat at the end of the month, consider getting a savings account or a jar to put that money into, then when you’ve got enough get a cow share. Since it’s just the 2 of you, I’d probably start out with as small as you can get, which I think will be 1/4 share, but can depend on where you are (someone where I live sells as small as 1/16th share). Typically the cost per pound is higher than ground beef, but you’re not just getting ground. It’s all free range, potentially local and a variety of cuts. Here’s a site to help you out. Jeff, you are making me so jealous of homeowners! I just don’t think we have the storage to buy a portion of a cow, which is why we are sticking with the CSA model even for meat… How much space do you think it takes up?? Thanks for the website suggestion! I’d estimate that it’d take up a fairly good amount of one of the smaller size chest freezers. My friend did it once and he had one of the smaller freezers and wasnt concerned about the volume. If you get too much, just have BBQ right away! Just curious if you have looked at the caveman diet? Sounds close to what you try to eat. I use Parmesan pretty much whenever I sautee vegetables, which is typically daily. Cheddar is a near-daily staple as well. As for non-cooking cheeses, I like most everything, especially blue cheese (Kyle very much disagrees so we don’t buy it). Haha I wouldn’t eat that either but I can see Kyle doing it as he likes both ingredients! This is absolutely one area where I realize I am so super spoiled. I can get humanely raised organic chicken for $2.99 a pound. Portlandia might be weird but we do love our humanely raised meat! From where do you buy it? Grocery store, farmer…? I think this is a great goal, and reaching your long term goal by increments is a path to success, IMO. That is actually pretty similar to my system! My spouse and I both cooked mostly vegetarian at home even before we met out of frugality, but in the last year or so we’ve been adding it back in by getting meat at the farmer’s market once a month or so (mainly because I’ve been finding it irresistible). I try to make sure it fits into our regular grocery budget even though it’s insanely expensive (like $8-11 per lb*) by trying to only pick up necessities at the grocery store and choosing recipes that stretch the meat pretty far. It just wouldn’t be manageable if meat were something we ate daily instead of every week or two, though. *local food prices in my area are high – we pay $15 for half of a $30 CSA share, for instance. The tradeoff that I have slowly been noticing is that I’m not buying quite as much cheese or yogurt in order to put more $ toward meat. Our cheap staples are grains, eggs, and either beans or tofu, and it’s pretty easy to go mostly vegan with those. It would be harder to do with your diet though. Yiiiiikes. The sausage I can directly compare because from our CSA farm it’s $4.50/lb. The cheapest vegetables are $1.50/lb but $2/lb+ is more typical. Yeah my “staples” are ground beef and Brussels sprouts :), though I also eat eggs almost daily. Sometimes I go through phases when I eat beans but not currently. I’ve been reading recently about tempeh but I doubt Kyle will touch it. I’ve also shopped for whey protein powder in the past but I just can’t bring myself to step away from real food to get protein. Oh yeah, the BF is worried our combined grocery spend, cause I shop at a co-op that has a lot of fair trade/organic stuff. I don’t make a preference to otherwise buy these ethical products, but I shop at the coop as a ‘zero waste’ challenge. But I think my spend + his spend will not equal our combined spend, but we’ll see won’t we! SarahN recently posted..A new home! I got into the local, free range meat thing a few years ago by joining a co-op. However, it was crazy expensive for the amount of stuff you got. I don’t know that it tasted any different, but ideally, I felt better. Then we went into debt payoff mode, and drastically cut out grocery bill. I will buy free range meat at the grocery, but only if it happens to be in the clearance bin. You can buy a half side of beef locally, but if you don’t have a freezer or friend to split with, that’s a lot of meat, and we don’t eat all the cuts, so I don’t feel that’s a good use of money. I wish it were more affordable, and maybe it’s a priority I need to make? I only buy organic milk, maybe meat should be scrutinized that way as well. Now that you’re out of consumer debt, do you plan to re-join the co-op or get similar food from elsewhere? That’s funny! I read TOD in college so I didn’t know anything about organic or local before it. I didn’t change anything immediately but that’s why we eventually got our CSA subscription and part of why I don’t want to be eating grain-fed beef (that plus the Paleo/Primal literature). Do you agree with any of his conclusions/philosophies that you came to independent of the book? Kyle HATES frozen vegetables – he’d rather eat canned, which I think are gross. It’s pretty much all fresh for us with some canned for his lunches. If I buy frozen produce I tend to forget about it. With a house of 5 we also shop in bulk at Sam’s though. We buy meat mostly because of the boys and if not when a few minutes they are hungry again. The wifey and I don’t eat as much meat as we use to but we don’t actually spend more for quality meats. We use to do canned but move to frozen. Fresh things just seem to get forgotten about and ends up being money wasted. We are looking to getting a deep freezer so I can just stock up on meats and frozen vegetables to cut down on the trips to the store. I think a chest freezer would be a good idea. We had to be super intentional when we first started our CSA to not let our fresh food go bad, but now that we’re in the groove it’s not so hard. We freeze basically all meat that comes our way now and only keep about 1-2 lbs in the fridge at a time. When you have that nice big storage space it will be easier to spend less because you can stock up during sales. We (read: my wife) cooks almost all of our dinners, and I make my lunches. Breakfast is typically cereal/bagels. So for the most part we’re cooking our own meals, but we’re not really thoughtful about where the food is actually coming from. It’s just never been something that’s been very important to us, so I guess that puts us in a similar place to Kyle. Our big discretionary spending category is travel, mostly to visit my wife’s family. If something is important to you, the extra cost can definitely be worth it. We want to put lots of money into travel savings, too – it’s hard to strike a balance between quality in day-to-day living and special occasions. I’ve tried showing Kyle some Netflix food documentaries (Food, Inc. draws HEAVILY from The Omnivore’s Dilemma) but even so he’s not really into it. I sort of came to it from caring about environmental issues and also learning about nutrition for weight loss. I don’t eat red meat (don’t like the taste), but I will spend extra on quality produce. It’s the next step in the life overhaul I’m working through now–to eat better, healthier food. I see where you’re going with this, and I agree that it’s worth it! What are your next steps toward eating healthier and do you have to make room in your budget? I so want to be a healthier eater! If only Whole Food wasn’t so expensive! I try to eat less red meat and I don’t eat pork at all. My bf is pretty much a vegetarian right now and he likes it. I don’t know if I can ever do that completely. I like chicken sandwiches too much. Haha, actually reading The Omnivore’s Dilemma made me swear off Whole Foods entirely, which is definitely a boon for our budget. 🙂 Do you just eat a lot of chicken to get your protein or what vegetarian foods do you eat for it? I’m not opposed to vegetarianism but it’s pretty challenging to get enough protein without meat while eating low-carb and real food. I just started watching The Perfect Human Diet (CJ Hunt) on Amazon Prime on my lunch break today. So far, I really like it. $12 for a CSA is amazing. We did something similar here 2 summers ago but it was really expensive, so I’ve been buying from the farmer’s market directly. Good quality food is an investment in good health. KK @ Student Debt Survivor recently posted..Hate Your Job? Go Back to School!